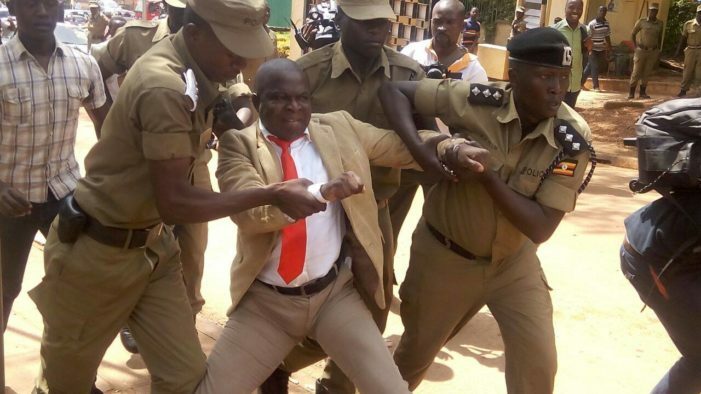 KAMPALA – Kawempe Division councilor Mr Muhammad Ssegirinya, has petitioned the Attorney General, demanding sh1.4b compensation from government for the injuries and public humiliation he suffered after allegedly being punched by a police officer after he was arrested in a demonstration on Sunday. Through his lawyers of Muwada and Company Advocates, Ssegirinya, who was arrested while protesting over the poor drainage system in his area, says the actions by the police officers towards him are inhumane. “Our client was physically heavily boxed by a uniformed three police officer and his heavy well practiced fist landed on the chest and head of our client while handcuffed within the premises officially used by Uganda Police Force as Mulago Police Station,” reads in part the November 19 letter, which is also copied to the chairman of the Uganda Human Rights Commission, the Inspector General of Police and the Kampala Metropolitan Police commander. “The actions and omissions of the police officer were criminal, actionable and a grave violation of the fundamental human rights. Such treatment was illegal, criminal, degrading, and inhumane and caused our client psychological and emotional torture, stress and embarrassment as a public leader,” the letter adds. He said it was wrong for police officers to punish him by beating and boxing him during and after his arrest on Sunday as if he was already guilty of the crime, warning that if nothing is done to address his plight, he will sue for compensation and damages worth Shs.1.4 billion for the physical and psychological torture and trauma inflicted on him by officers of government. “Unless you heed to our demands herein, we have instruction to pursue legal redress in courts of law at your own cost and continued public embarrassment,” he said. During the demonstration, Ssegirinya carried jerricans of dirty water, claiming he was taking them to KCCA headquarters at City Hall in Kampala to protest what he said was continued failure by the authorities to work on the drainage in the area, which caused flooding following the Sunday morning downpour paralyzing businesses and filling up several houses.